KJ Taylor is a young author and The Dark Griffin is her first book. This combination (in my experience) frequently makes for a naively written book that I generally find easy to dismiss. From the first chapter though, The Dark Griffin engaged and intrigued me. Taylor has written a cohesive and powerful tale, peopled with deeply layered characters and set in the wonderful tapestry of a new fantasy world. Arren Cardockson became a revered griffiner by luck alone – his Northern heritage marked him otherwise as outcast. From the chance that bought him his position, hard work and intelligence continued to improve his position in life. But there are those who fear what he might become, and who put every obstacle possible in his way, and herein lies the crux of the conflict in the story. 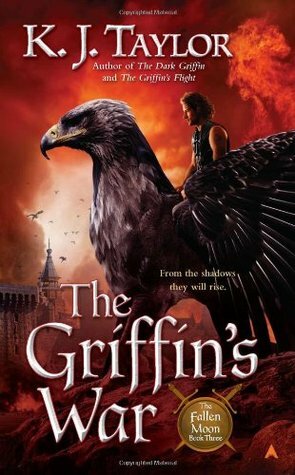 Cardockson is not the only protagonist the reader gets to know, however; the griffins themselves are captivating. While somewhat anthropomorphised, they still present an alien counterpoint to the human drama. Chief is the tale of the rogue griffin who becomes known as Darkheart; his story is fascinating and heartbreaking, and mirrors Arren’s own challenges, until their stories become entwined, by chance and choice both. While I would not class The Dark Griffin as a young adult novel (the style and subject matter don’t really match the usual criteria), neither is it unsuitable for a secondary collection. There is death and violence throughout the book, and some intimations of sexual activity between adults, but not in a graphic or even overt manner. The writing is not too challenging for older teens, and I would recommend it for readers 14-plus. Taylor has produced a wonderful new world to explore, and I have no doubt she will continue to draw in readers as her popularity grows. She is a shining new light in Australian fantasy, and I look forward to seeing where her star takes her. Arren Cardockson is a wanted man after he brought down the ruling class of Eagleholm, effectively (if unwittingly) destroying the city and its government of griffiners. On the run with the wild griffin Darkheart (now named Skandar by Arren), he heads towards the North, the only place he can think of where he might find peace. But peace is not in Arren’s destiny – first coming across the strange woman Skade and joining her on her own strange quest in the hopes of redeeming his own curse, then being captured and enslaved, Arren crashes from crisis to crisis, embroiling himself ever deeper in a spiral of rage, fear and hate that has no visible way out. I was disappointed by this book – I enjoyed the first one of the series so much and had really been looking forward to this. Unfortunately, the writing, characterisation and plot simply didn’t live up to the promise of the first novel. I was particularly frustrated by major changes in the character of Arren himself – the enormous difference between how he was written in The Dark Griffin and how he is shown here is simply too overt, and not sufficiently supported by the underpinning plot. Another small annoyance that kept jolting me out of the story were the names the author applied – with Skade and Skandar both in close contact with Arren (also called Arrenadd, which gets tough when the character of Arddryn is introduced), and Arren’s grandfather called Skandar and father Skandarson, it becomes confusing at times – I understand the reason for the convention (except for Skade – that really irritated), but it still aggravated me. 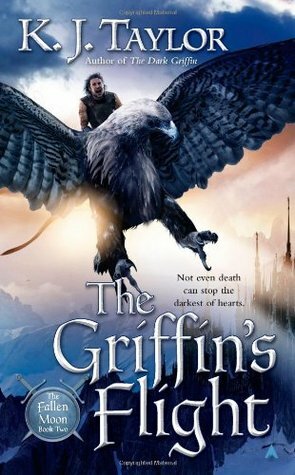 In my review of The Dark Griffin I noted that the book wasn’t really aimed at young adults – to some extent, this book fits the YA mould a little better. Sadly, the writing in The Griffin’s Flight doesn’t live up to the ideas and at over 600 pages, it’s hard work at times. I still like the premise, and the book isn’t bad, exactly;it just doesn’t meet the high expectations I had based on the first book – I wanted it to be even better, not a step down. So this is a lukewarm review from me, but one that is based on my own anticipation more than the flaws of the work (although I do think a stronger editorial hand would have immensely improved the book) – I’m certain other readers will still enjoy it! 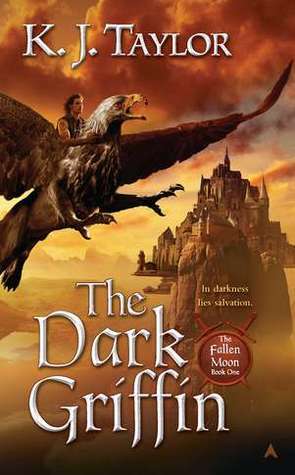 The dark griffin Skandar, along with the griffin/woman Skade, search to find Arrenadd, who is both saviour and destroyer. Plans for vengeance by those who survived the destruction of the griffin city dog the Northerners at every turn – who will survive the clash of two peoples? I struggled with this book and I was very disappointed that I found it such hard work. I really enjoyed Taylor’s first book in this series, but the second and third have been a challenge. With book two, it was more that I was not as impressed as I had been with the first one, rather through any fault of the book itself, but this time, I think the story, characters and writing have really let the initial idea down. The complete reversal of characterisation really threw me for a loop, and this was never justified well enough to make it believable for me. The writing meanders and the action is poorly paced. The world building maintained its complexity, but was let down by a plot that simply did not, to me, make sense or live up to the expectations created by the first book. It’s hard to me to give a bad review, particularly for an Australian fantasy series that showed such marvellous promise early on, but sadly, I can’t recommend the series based on the strength of one book. This just didn’t satisfy.